청주시 운천동에서 금동불상과 고려시대의 청동 금고(金鼓)와 함께 출토된 동종이다. 총 길이가 78㎝, 종 몸체 높이 64㎝, 입지름 47.4㎝인 중간 크기의 종으로 위·아래 단에 어떠한 문양도 없이 단순하게 구획만 둔 것이, 오히려 이 종의 특징이다. 사각형의 연곽 너비 부분에는 3구의 비천상과 당초문, 3보 문양으로 꾸몄고, 그 안에 9개의 돌출된 연뢰(蓮蕾)가 있다. 종 몸의 앞뒤에는 2구의 비천상이 조각되어 있다. 연꽃으로 장식한 종을 치는 부분인 원형의 당좌를 2개 배치하였는데 당좌에는 덩굴무늬가 새겨 있다. 현재 용통은 일부 없어졌으나, 종의 고리부분인 용뉴는 한 마리 용이 입을 벌리고 목을 구부려 천판을 물고 있는 형태가 완전히 남아 있다. 또한 앞뒤 두구의 비천상과 당좌의 문양으로 미루어 통일신라시대 후기(9세기 중엽 경)의 종으로 추정된다. 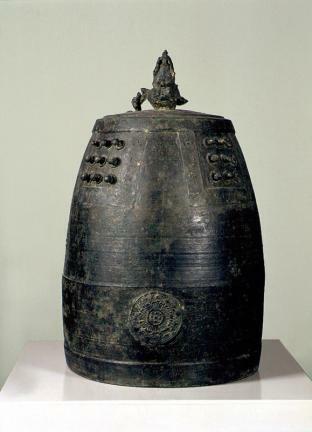 This bronze bell was excavated from Uncheon-dong, Cheongju, along with a bronze statue of Buddha and a Gong-shaped Golden Drum used for Buddhist rituals. This is a mid-sized bell with total length of 78 cm, body height of 64 cm, and mouth diameter of 47.4 cm. The bell is characteristically simple; it has no design on both top and bottom parts. Within the band along the square-shaped frame are patterns of three flying deities, several vines, and three treasures. Inside the frame are nine protruding round bumps. 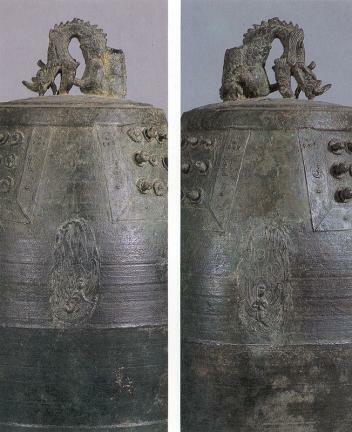 Two flying deities are sculpted on the bell’s body. The bell has two striking points decorated with lotus flower designs, with the pattern of vines engraved between the striking points. Although part of the sound-reverberating pipe is gone, the loop at the top of the bell – having the form of a dragon with its mouth open wide and the neck slightly bent -- is found intact. 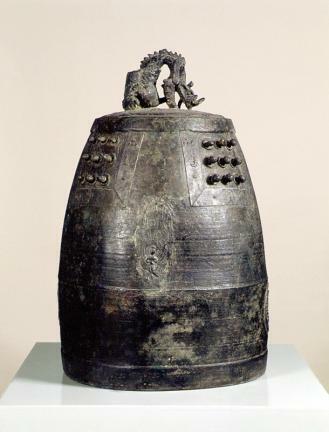 The design of the dragon suggests that the bell was made during the late Unified Silla Dynasty (8th-9th Century).